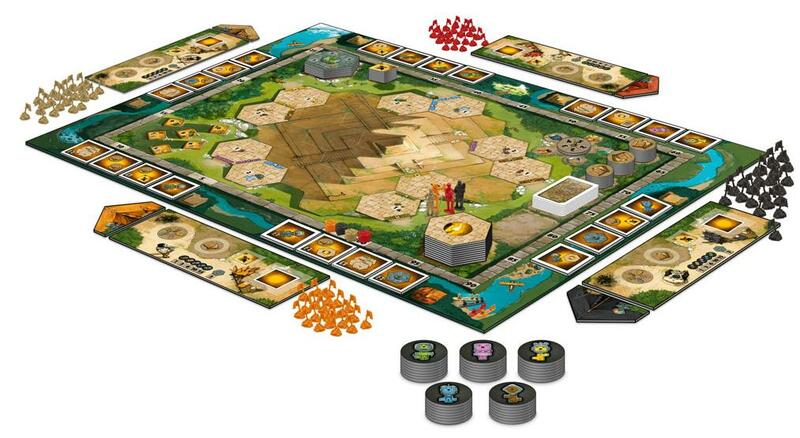 The original Tikal is a classic game of archaeological discover where players spend action points to send their explorers into the jungle to excavate temples and collect treasure. 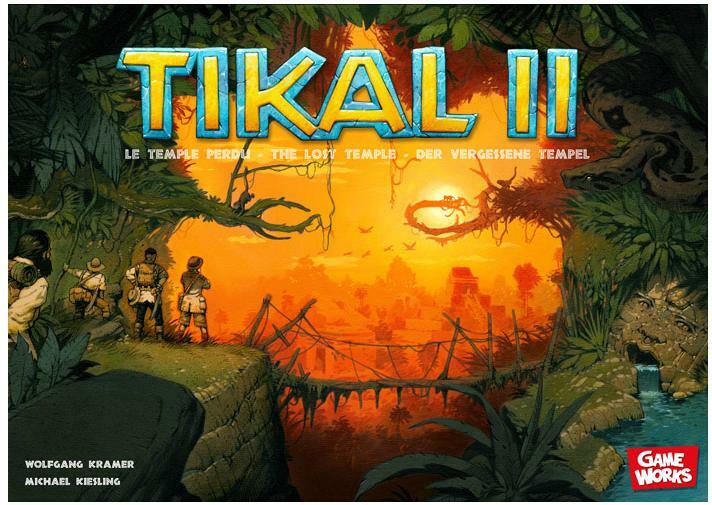 Tikal II has a similar premise but this time the players explore a single temple revealing its rooms and grab treasures using coloured keys and secret passages. Each turn, a player moves their boat around the temple and picks up one of the remaining action tiles. The action tiles dictate what a player does that turn – adding a new room to the temple, gaining a coloured key, gaining treasure (to sell later), taking a card (special abilities or end of game points), secret passages (to use later), and so on. Each time a player’s boat starts a new lap of the temple, they must discard a key (or lose points). So, rushing ahead to grab an action tile comes at a cost. Once all action tiles are taken, points are scored. After the first scoring, the action tiles are laid out again and play continues (but in anti-clockwise player order). After the second scoring, the game ends and the player with most points wins. Players that take treasure can sell it as their boat passes certain locations. The value of each treasure type changes every time a player sells some treasure so timing your sale is crucial as the price can go from its highest to its lowest price in a single turn. Secret passages help players get through doors (and walls) without a matching key but they’re also the only way to access special tombs outside the temple and the final treasure room which are worth a decent amount of points. Special cards can come in very handy too as these give one-off abilities and some give bonus points. After performing the tile action, a player then moves their explorer in or around the temple. To move from room to room, an explorer needs the coloured key that matches the coloured doors that link the rooms. So, when placing rooms you try to can position them so you can reach them (and so others can’t) and you try to collect keys that open the most routes. When an explorer finishes their turn in a room, they can place a flag of their colour there and score points (based on the number of flags they have on the board in rooms which have the same colour doors as their current room). So, there’s a potential multiplier effect by focusing on specific colour rooms, but this is limited because you can only place a flag in any room once. Tikal II is a very pleasant game. The players are affecting each other by taking tiles, treasure and placing flags before their opponents can but it feels very amiable. Actions are simple and quick, plus you’re always keeping an eye on what action tiles are left, so there’s little downtime. There are a lot of ways to gain points in the game and you need to work out what will get the most for you. Players who want very accurate tactics and only a few avenues that deliver points may not like the more open nature of this game. However, I actually liked having different routes to score points as it meant I never felt like a turn was totally wasted (and I knew when another player’s actions denied me from earning a greater score). It’s having these different routes that makes the game feel so amiable – your best idea may be blocked but you can earn points another way. As the action tiles start to disappear your options become more limited and it gets more interesting because you have to work harder for your points. I didn’t find I was taking action to stop another player doing so on purpose and I just focused on what I needed – maybe that denial play will develop when knowing the game better. Collecting treasures is intriguing but you must sell them before another player ruins their price by selling their own treasures. 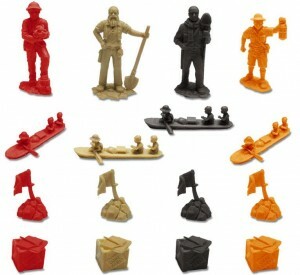 As with all the games published by Game Works that I have played, the physical quality and visual design is excellent. The flags and adventurer pieces are very on-theme and the graphics are colourful and rich, but the good design goes further. The tents that get placed on the end of the player boards not only record if a player has used their special action, but also indicate the direction of player order. Also, the plastic inner of the box not only has specially sized compartments for every piece of the game, but each location is numbered too and these numbers match those on the set-up diagram in the rules. I wish all games were boxed like that. In the original Tikal, a player drawing a hex tile with a temple on were at a distinct advantage over those who didn’t (because their placement could affect the game quite a lot). In Tikal II, players do the same with the temple tiles; however, I felt it was less easy to inconvenience other players which reduces the power of random draw of the tile being placed. I think this is good but some players will prefer it and others won’t. I didn’t find any major negatives to the game. Before playing, I expected there would be lots of working out which keys would be needed to access which rooms but I found this was quite simple. That’s not a negative, it just wasn’t a positive that I had expected (and it may just have been the game we had). Adjacent hex tile edges without a coloured door on either edge are impassable, but there’s no visual indication of the wall there as there’s no border along the hex tile edges – this is slightly counter-intuitive as, when pushed neatly together, it’s easy to forget the physical edge of the tiles are the only indicator that that path is impassable. I would have preferred borders along the hex tile edges to show this (even it does mean a wall on one edge next to a door on the other which is passable with the right key). Creating a sequel (in any medium) is a tricky business: Too similar and why have both (I’m looking at you Priests of Ra); too different and then it’s not a sequel at all and it’s falsely trading on another game’s name. Tikal II is a very good sequel with has lots of similar ideas but delivering a very different game so it hits the right balance. Tikal II feels looser and friendlier (almost more casual) than its forebear so those looking for the tightness of the original may not be as sold on Tikal II. I found there are lots of options to think about and it’s possible to plan how to maximise your score. Tikal II is entertaining and satisfying without being too intense. This entry was posted on Monday, November 29th, 2010 at 12:22 am	and is filed under Board Game Review, Board Games, Essen Spiel 10, Tikal II. You can follow any responses to this entry through the RSS 2.0 feed. You can leave a response, or trackback from your own site. Great overview and review. I’m really looking forward to this game! Your point about sequels (and calling out Priests of Ra) is a good one. Granada is not much more different from from Alhambra. But you’ve intrigued me enough to want to try Tikal first and then Tikal II later on. Cool. Let me know what you think of Tikal I and how it compares to Tikal II. There’s a Tikal I iPhone version coming soon which I’m looking forwards to.